I know I go completely against my Nebraskan heritage when I say this, but I'm not very big on beef. The idea of cooking it is usually too intimidating. I personally can't eat it unless it's basically leather while some people consider it ruined if it's not still mooing on their plate. So I usually go with a less polarizing entree option. However, I'm happy to say I've found a recipe for beef tenderloin that's easy to prepare and will definitely please a crowd. The trick with this is too prepare it medium rare (for the freaks who like it this way) and then if anyone wants theirs cooked a little longer, just stick those pieces directly back into the oven. Preheat the oven to 475 degrees. It's getting hot in herre. Rinse your meat and pat it dry with a paper towel. Put the meat on a cutting board or some sort of surface and sprinkle all sides with the Lawry's Seasoned Salt. Don't be dainty with it, we're talking very generous sprinkling here. Put the peppercorns in a ziplock bag and close it. Place the bag flat with the peppercorns evenly spaced out in a single layer on your cutting board. Grab your hammer/mallet/tenderizer. Remember that guy who cut you off in traffic last week? Or when Neiman's wouldn't refund you for the dish you bought that had a chip in it? Or that one time the U.S. elected a human cheeto? It's time to take your rage out. Grab your hammer/mallet/tenderizer and really go to town on the peppercorns. They don't need to be 100% smashed, just mostly broken up. Set the bag aside and cool down if you need to. Heat your olive oil in a heavy skillet. Get it nice and smokey, then place the tenderloin in the pan sear it. Once it's nice and brown on one side, flip it to the other. While you're doing this, place a few chunks of butter in the mix. Ya know, to make it nice an healthy. 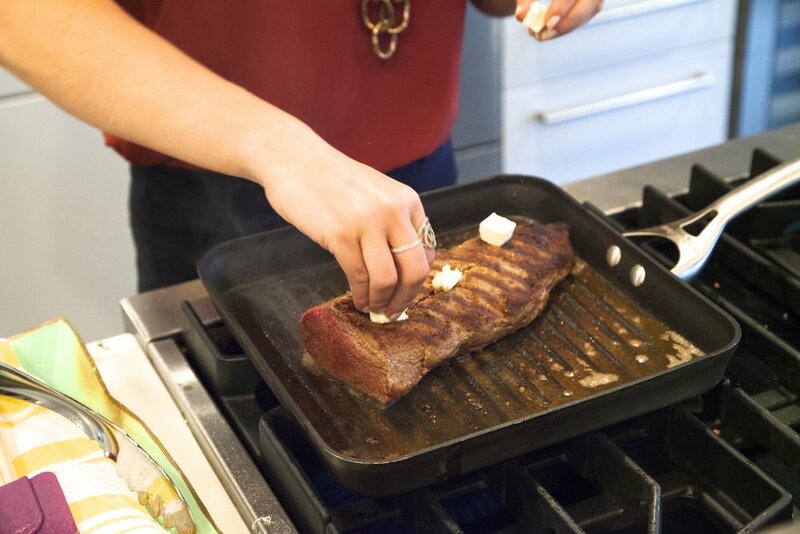 Once it's slightly browned on all sides, place the tenderloin directly onto the middle rack of the oven. Place the cookie sheet on the rack beneath it (or the bottom of the oven). Grab the peppercorns you took all of your aggression earlier and sprinkle them all over the tenderloin. Add the rest of the butter so you're sure it's healthy. Leave it in the oven until it reaches about 145 degrees for medium rare. Here's a helpful chart for temperatures. Once you've reached the desired temperature level, take the tenderloin out and let it sit for 10ish minutes before carving it. *Tip: When you're buying the meat, ask the butcher if he/she can trim the fat. Otherwise make sure you do this as your first step but be sure to not cut all the fat off.